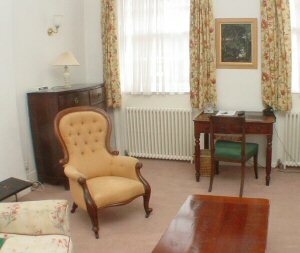 One bedroom flat at 33 Balcombe Street (2nd floor) in central London for long term rental..
No. 33 Balcombe is the largest house on the street and has a large one bedroom flat on each floor ranging from 630 (top floor) to 540 square ft. The top floor flat is the largest and is the only one with a double bed in the bedroom. The kitchens are fully equipped and all have a table and chairs where meals can be taken. As well as the beds each flat has arm chairs, desk, TV, table, chest of drawers etc. The bedrooms have twin beds or a double, wardrobe and chest of drawers and each flat has a self contained bathroom with full bath and shower.